KORE Potash has unveiled the terms of a definitive feasibility study of its Kola project situated in the Republic of Congo (RoC) in which the prospect will see production of some 2.2 million tonnes of potash a year over a scheduled life of mine of 22 years. Pre-production capital expenses will be a whopping $2.1bn (R28.7bn), of which about 60% can be debt-financed, therefore raising the question as to how the London- and Johannesburg-listed firm intends to finance the balance of the capital cost. 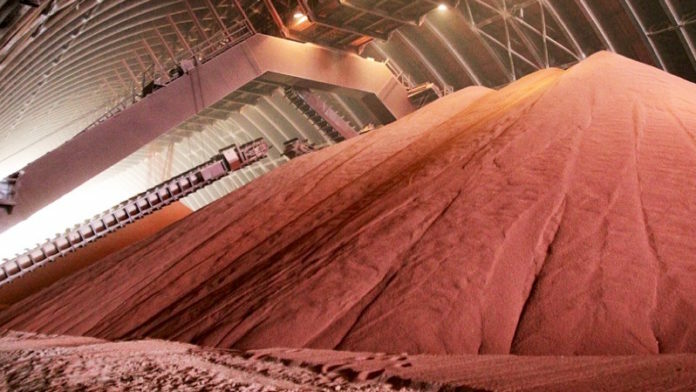 “Kola is designed to deliver potash to markets in Latin America and Africa at a significantly lower cost than other potash producers over a long time frame,” said Brad Samson, CEO of Kore Potash in a statement to the JSE today. “It stands out globally as a project that needs to be brought into operation to meet the growing global demand for MoP (Muriate of Potash also known as potassium chloride)”. There are some sticking points, however. The feasibility study, which was delivered late by the consortium of French consultants (FC) who undertook it, has room for improvement, said Kore Potash. For instance, there are opportunities to reduce the capital cost of the project by $117m and limit the construction schedule to 40 months compared to the current schedule of 46 months, it said. Kore Potash is also seeking clarity from the RoC government regarding the transfer of a 10% stake in the underlying company that owns Kola in terms of a mining convention signed with the government. A environmental and social impact assessment (ESIA) also needs to be approved by the RoC government. Said Sampson: “In the near future, we expect the amended ESIA to be approved as the last step to full permitting of the Project.” He added that the company was “looking forward” to the submission of an engineering, procurement and construction (EPC) proposal from the FC which is due three months after completion of the definitive feasibility study. “The FC have advised Kore that they expect to provide an EPC proposal to Kore within this quarter,” the company said. Some of the other aspects of the feasibility study is that Kola will have a 4.3-year payback period and a real ungeared internal rate of return of 17% on an attributable basis assuming a life of mine potash price of $360 per tonne, including the cost of delivery. The average annual free cash return would be $500m based on pre-tax earnings of $585m a year. The all-important issue will be how Kore Potash finances a project of this magnitude. It said in its announcement today that owing to the high operating margin and high free cash return on invested capital, the project has a debt carrying potential of up to $1.4bn, according to Rothschilds & Co., Kore Potash’s financial advisor. “Further work will be required to optimise the project and there is no certainty that the identified improvement opportunities can be realised,” it said.